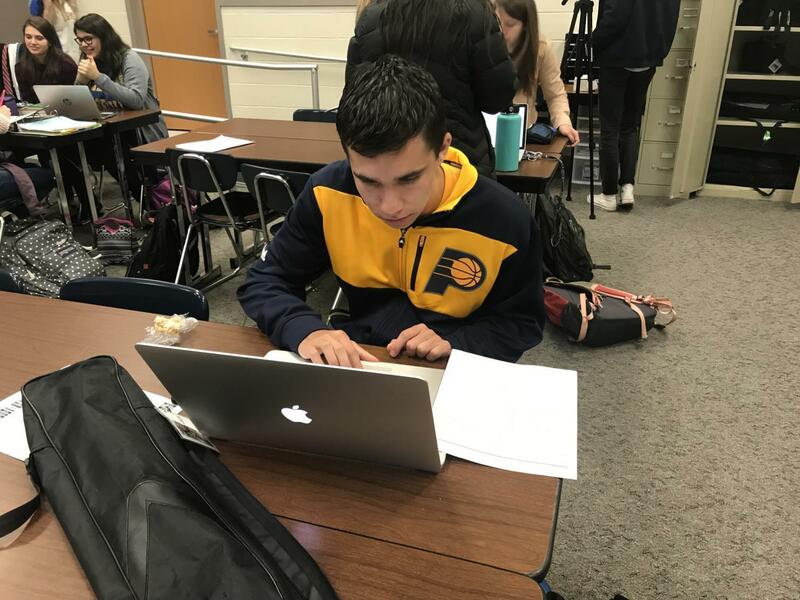 Jackson Yeary, CHTV staff member and senior, puts together a basketball video. Yeary said he spent his SRT working on CHTV-related assignments. According to sponsor Anna Kaiser, CHTV will cover spring sports, the spring musical, Music for Miracles, Teacher of the Year and the Top 3 Percent Banquet this quarter. Kaiser said the events CHTV covers are mostly the same, but the way CHTV staff members cover them each year is different. “It’s new each time a student has a different idea and a different angle. The way we film things, it always turns out to be a video. I would say that all of the videos are a little bit different because each student has a different artistic eye (in) what they like to do with cinematography,” Kaiser said. Jackson Yeary, CHTV staff member and senior, said he will announce baseball games and make different video packages this quarter. According to Yeary, he will cover the Carmel Education Scholars Banquet alongside Stephen Abshire, CHTV staff member and senior. Yeary said CHTV will ask students “Big Questions,” which is something CHTV started to do this semester.